He could once tell the truth? Poet’s Notes: One of my favorite images from the Bible is that of the wrathful cherub(im) placed as a guardian blocking the entrance of Eden. 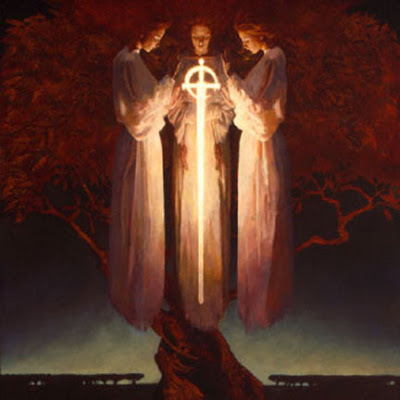 In the poem, I think of it a single cherub holding the sword in hand, as that is how I often picture it in mind, even though the text appears to reference multiple cherubim, and the sword itself as alive and active on its own accord. Whatever the case might be in the Bible, I think it is more dramatic if it is a single entity and so I went with that. Also, I do think is notable that the first angel(s) in the Bible are beings of punishment though I make them something a little different. In this poem, I take the cherub as being the irreversibility of the past, whereas the Serpent/Satan, who promises that we should "be as gods" to Eve, represents the voice of regret that would have us return to a past and so make right what has gone wrong. Who amongst us has not fantasized about going back and changing something about the past? That is why I conclude with the idea that though "Satan is indeed / the father of lies / but who amongst us has not wished / he could once tell the truth?" I wrote this poem in all of five minutes after breakfast. It came to me quickly and required only minor revision. The simple aesthetics see a large single stanza on the main theme with the ending offset in a separate stanza to underscore the recognition of the role regret has in all our imaginations. The indentation fixates on the imagery of the cherub, which I think underscores the blocked pathway to the past and the futility of listening to the Serpent's nonsense. Then again, we can't help but be nonsensical sometimes. It is also purposeful that the Eden so represented is the past, as the past always seems a promised land that we have abandoned for a present that is unsatisfying due to our regretful choices. For that reason, maybe the cherub really does represent regret in the Bible, as surely Adam and Eve must have felt for their transgression. Though given that our past actions make us in part what we are, perhaps it is not so bad that the cherub stands there, lest we undo ourselves by undoing the past. It is somewhat of a cliché to reconcile oneself to suffering by accepting that this suffering is a part of oneself, but it does appear to be true that we are what we are because of all of that. The assumption that this is a good thing is not one I find especially convincing, but whether good or bad, it appears true and irrevocable at any rate.